Streamline Tower Las Vegas condos partner is a former professional baseball player Dusty Allen, who spent time with the Las Vegas Stars, is learning the Las Vegas real estate development business of the 21-story, 275-unit Streamline Tower condos in Las Vegas. Professional baseball players lead a charmed life, but Dusty Allen knew it wouldn’t last forever. The power-hitting outfielder who played for the former Triple-A Las Vegas Stars and made it to the big leagues with the San Diego Padres and Detroit Tigers started thinking about life after baseball long before a back injury ended his career in 2001. Allen went from slamming home runs at Cashman Field to pitching a Las Vegas high-rise luxury condo project Downtown Las Vegas next to Fremont East. As managing member of the 21-story, 275-unit Streamline Tower Las Vegas, Allen is learning the Las Vegas real estate development business. Allen traveled the country and the world during his minor-league career, including stints with the Idaho Falls (Idaho) Braves, Clinton (Iowa) Lumber Kings, Mobile Bay (Alabama) Bears, Las Vegas Stars and Toledo (Ohio) Mudhens. When it was over, he settled in Las Vegas, where he had bought a home for the off season. He lives here with his wife, Susan, and 2-year-old daughter, Logan. Question: How did you get into high-rise development? Answer: I was already doing real estate transactions, including investing and different types of activities and ultimately came across the opportunity to join a group that was purchasing the Golden Inn (at Las Vegas Boulevard and Ogden Avenue). We recognized the opportunity for high-rise and to be on the front end of the wave in June 2004. Question: What have you learned about the business? Answer: I’ve learned that there are a million moving parts in a real estate transaction of this magnitude. I’ve learned that all my business skills, including organizational skills, become extremely important in getting Streamline Las Vegas condos off the ground. It’s exciting and it’s exactly what I want to be doing. 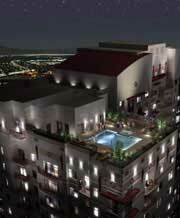 Question: How do you see the Las Vegas high-rise luxury condominium market shaking out in Vegas? Answer: I see this high-rise market being the wave of the future. We’re running out of developable land; we have to go vertical. With the number of people that are coming to Las Vegas and will continue to come for various reasons, it’s inevitable. Call 702-505-6988 for VIP Las Vegas condo representation for Streamline Tower Las Vegas by a Las Vegas real estate agent. Streamline Tower Las Vegas condos partner an ex-ballplayer.